The first field of these records is the full name of the voter, the second is the birthdate and the third the ID. I have written before about Venezuela's electoral registry...basically stating it is a mess. There are many more patterns that hint at some tampering. In some countries you can go to vote straight away on election day without having to do anything before: the population registries are organised in such a way that if you are a national of that country and you reach voting age, you are automatically placed on the list of voters, you just need to show up when there are elections or ask for a registry change if you move. There are other countries where you have to register once for the first time and once every time you move from location. One such case is the USA (at least some states, readers can correct me here). In any case: in countries where you have to do the extra step and go to register for the first time one would expect some people not doing so, specially if the registry is not compulsory. The current Venezuelan government tells us the percentage of adult Venezuelans not registered to vote is very low, around 3.5%. Now, they also said there are around 19 million voters now. But the government-dominated Instituto Nacional de Estadísticas also said the country has 28,9 million inhabitants. That means - if both are right - that 9610659 persons are under age or cannot vote in national elections because they are foreigners. That is 33.25% of the population. The average age of those registered in the CNE is around 43 years old. The average age of the Venezuelan is 26 years, according to the INE. 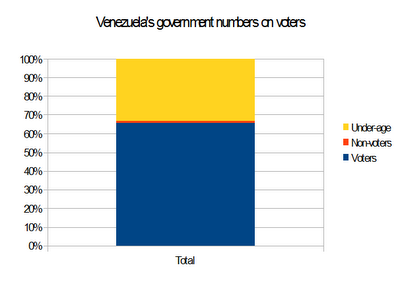 Now: how come abstention in Venezuela can range from 26% to 36%? Why do so many people bother to register in the first place? Actually: either the late Census doesn't make sense or it is the electoral registry that doesn't...or both...and that is why we won't get any detailed information about age distribution from the last census until well after the presidential elections. Unfortunately, once you enter some records into the electoral system, it is very hard to get that system cleaned. You can ask people who are supposed to be older than 120 years to show proof that they exist (the government does it now). You could eventually request the same from the 20% who were born in October 1976 (not done yet) and so on, but who is going to control you if you actually work for the current government and you are in charge of the electoral registry? Only if we could get witnesses at every voting centre can we be sure there is no massive tampering with results. And tragically, we do not have that capability outside Miranda and a few other Northern-central regions.